In 1994 Katrina and Andrew Dabrowski move in to their house in Eagle Rock Hills. They discover and unit for lease in the nearby small shopping plaza. The unit was prevoiusly used as a restaurant. Since Katrina had a Big Heart for cooking, especially Polish food , they decided to give it a try and open Polish Restaurant. That year in June "Polka Restaurant" open its firts door for dinners. Thrue the years Polka got very popular around locals in Eagle Rock and Glassel Park. In the future years Polka was invited to be on tv shows like "Dinner Drives and Dives" with famous Guy Fieri, also has been in local KCET show called "California Golds" with Huell Howser. The publicity was making Polka very busy. Sometimes people event waited for 2+ hrs to get the table. In 2011 Katrina and her husband made decision to retire and move to Warsaw, Poland to be closer with their roots and family. They decided to teach Katrina cousin,Mike how to operate Polka and how to cook all their dishes. In June 2011 Polka became Mikes venture. Mike , was born and raised in the fabulously beautiful lakes (2000 of them) region of Mazury in Poland. Ever since his youth, his desire was to become independent. This must have come with his genes, since his Dad, an owner of a magnificent Castle Hotel in Mazury, is a highly successful self-made man. This also must be one of the reasons why Mike wanted to get his higher education in the United States. In 2009 Mike, as his first name changed in America, graduated from the Business Administration Department of the Riverside University. 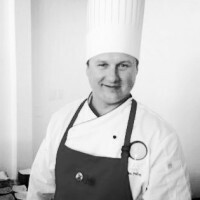 Since than he completed many culinary courses as well as a MBA in International Business in 2012. He always strive to be successful in what he does. Since 1994 we are selling delicious polish food at Polka Restaurant, 4112 Verdugo Rd. Los Angeles. Lots of customers have fallen in love with our products so we decided to open online store to deliver our amazing food to your door.